Meeting herbalist Xoma Ayobi is a peculiarly South African experience. When his neighbours in Hangberg, the fishing village part of Hout Bay, were temporarily relocated in a soulless line of wood and iron structures so that new housing could be built, Ayobi refused to move, with good reason too. He has a couple of horses, several dogs and a chicken coop surrounded by extensive gardens in which he grows vegetables and herbs. His informal dwelling on municipal land is not comparable to the cheek-by-jowl existence of his relocated neighbours. But it is in the way of a proposed re-development. City officials, at their wits end with Ayobi’s recalcitrance, approached Stephen Lamb of Touching the Earth Lightly with an unusual proposition: deal with this problem at the same cost to the city as a TRA house, that is R50,000-00, and enable us to move Ayobi without litigation, if you can. Lamb took on the challenge, drawing on his experience of the conditions on the ground and the vagaries of construction in “the fairest Cape”. Lamb sat down with Xoma in much the same way as an architect consults with a potential new home buyer. They ascertained the wants and needs of Xoma properly and together they co-authored the design of the first light house in Cape Town. The standard light house addresses some of the fundamental issues which face the informally housed on an on-going basis in Cape Town. Flooding in winter, fires in summer, food shortages all year round and the perennial hot potato: faeces disposal. Creative and low cost design has successfully addressed all of these challenges. The light house is on stilts and is therefore flood proof. Those of its windows that open are shuttered and the shutters are designed to close automatically in the event of fire (their ties are quick to disintegrate in the flames) thereby depriving the fire of the oxygen it needs to spread. Ayobi’s house does not have this feature because it is not in a densely packed high fire-risk location. On the outside of the north facing wall of the light house is a vertical garden of the kind already tried and tested at crèches in Langa. Made of cut through pvc waterpiping and enclosed in transparent fibre-glass sheeting, the vertical garden takes up virtually no ground space but can, properly tended, feed a family all year round. The light house has a choice of toilets: either a composting toilet if there is no water-borne sewerage available; or a normal flush toilet if there is. Unlike the single room shack it replaces, the light house has a small upper floor that serves as a bedroom. The pre-fabricated panels of which it is made are treated with magnesium, which has fire retardant properties that will render the issues around those fires that spread so rapidly in wood and iron informal settlements a part of history. Ayobi is excited to be the first recipient of a light house. The site chosen for him is a few metres from his existing informal dwelling. It has a magnificent sea view over Hout Bay Harbour towards Chapman’s Peak. He is quick to point out the features of the landscape which envelopes the site. The Sentinel, viewed from Ayobi’s perspective is a bearded old man’s head, his body is cooling off in Hout Bay; Karbonkelberg’s peak is the breast of a young women lying on her back, head toward the Sentinel and feet dipped in the cold waters of Sandy Bay. Ayobi’s eyes dance good-humouredly as he points out the sweep of his imaginations. It was necessary to get planning approval of the light house from each and every department of the city that routinely passes building plans for the formal housing in the leafy suburbs. The light house came through all processes with flying colours. It is an officially approved structure. Some regard it as “too beautiful” to replace the tried and tested TRA structures of Blikkiesdorp and Hangberg, but these objections become faint when the advantages of light houses at no extra cost to the state are explained. The design is available to all on the “open source” basis. Ayobi’s light house was erected in two days on 14 and 15 March 2014 by Lamb and his partner Andrew Lord. 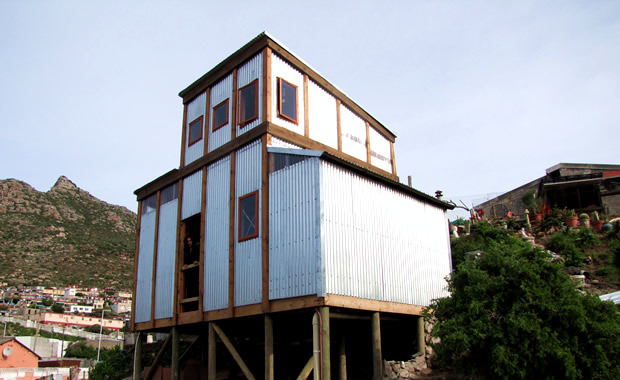 It stands proudly above the fish factories of Hout Bay, made of wood and iron, just like the TRA huts that Ayobi refused to occupy. The difference is that some wondrous creativity and design acumen was brought to bear on the light house, whereas the TRA structures are no more than boxes that are too hot in summer and freezing in winter. The airflow and insulation in the light house sees to it that no such disadvantages fetter its occupiers. Using materials locally available (only the magnesium insulation is imported) Lamb was able to bring the project to fruition within the budget of R50,000-00 which the city gave him. This was done by buying the materials from hardware shops at retail rates. If the pre-fabrication is done on a mass scale with material acquired at wholesale prices it will be possible to deliver a light house for assembly on site in Cape Town for around R30,000-00, including shower and toilet, vertical garden and chicken coop. The advantages of pre-fabrication, besides the lower cost, include speed of delivery, elimination of ‘shrinkage’ due to theft of materials lying loose on site and a consistent factory based standard. If light houses go into production in Cape Town they can be used to bridge the gap between delivery of a proper RDP house and the untold misery of living for years in a shack that is potentially victim to floods and fires and always undignified. The sanitation issues that have bedevilled relations between city and citizen will be addressed and the vertical gardens will give the unemployed decent work to do and a means of feeding their families. There are prospects for marketing the expensive herbs that grow so well in the vertical gardens – sweet basil, rocket and coriander all command great prices in Cape Town, especially if they are organically grown. The main problem that shack dwellers have on a daily basis is rat infestation. An experiment conducted by the Sustainability Institute in Stellenbosch revealed that composting organic waste using sealable buckets deters rats. The light house is in any event not hospitable to rats due to its superior design. Even the vertical garden can be rat-proofed with bunched chicken wire at its base and closed shutters. Put a lock on the shutters and theft of produce is made more difficult too. Alex Boraine has remarked in his new book “What’s gone wrong?” that: “It is extraordinary that the city council and the province cannot come up with a blueprint that will supply adequate and decent toilet facilities for the thousands that have totally inadequate facilities … informal settlements are washed out by the winter rains and the only solution appears to be to give out blankets and food parcels, which of course doesn’t solve the problem at all”. But he was writing last year, before the first light house was built. It could do, in life, for those living in informal settlements what the pyramids did, in death, for the pharaohs of ancient Egypt.